I finally made Smoothie No. 7 today – it’s a very fresh combination of melons and blueberries. Into the blender, put one cup of watermelon, one cup of honeydew melon, and one cup of blueberries. Add a couple of handsful of ice and blend. I really, really like this combination! This was my Mother’s Day evening pick-me-up drink. It’s quick and easy, and you can make it with any coffee you might have left over. Place frozen coffee in blender, add sugar and stir a little, allowing time for the sugar to dissolve. Add ice and almond milk; blend. 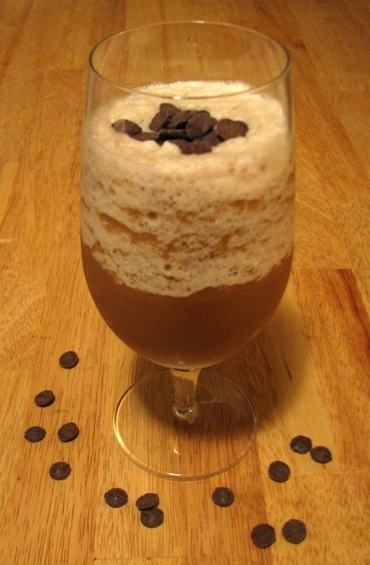 Pour into glass and top with carob chips or chocolate shavings. I DID A QUICK SEARCH for some new and different ingredients, we needed something fresh, sweet, something to wake up our tastebuds! 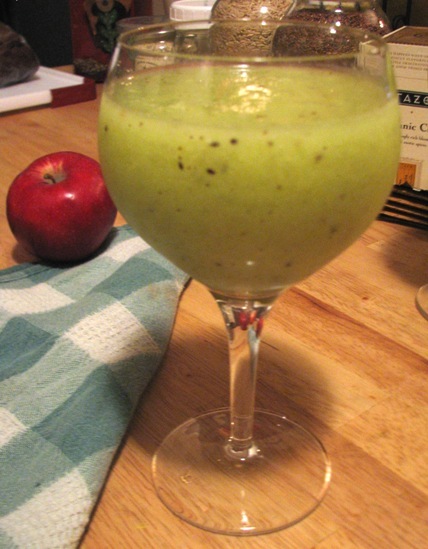 The perfect answer: this delectable Honeydew Kiwi Cooler from Good Housekeeping. This is a smoothie I will want to drink in the heat of the summer — so very refreshing! And I even dared to use lemon and honey again! How’s that for bravery?